One of my *.less files changes. 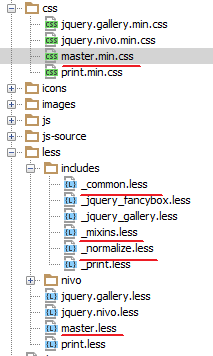 And it is included in some other *.less files, is it possible somehow to automatially recopile related files too? It should recompile master files automatically. after I made changes to common.less, I want application.less to be recompiled automatically because it depends on changed common.less. And that's exactly how it works for me -- master file recompiled when included file gets changed. Possibly it's due to your second thread -- the way you include partials (where they are located). Thanks, that problem was that "Track only root files" was unchecked. Not very obvious option name fot this feature I think. 1) I have files output only if "Create output from stdout" is checked. (output path is $FileNameWithoutExtension$.css), when does it work if it is not cheked? 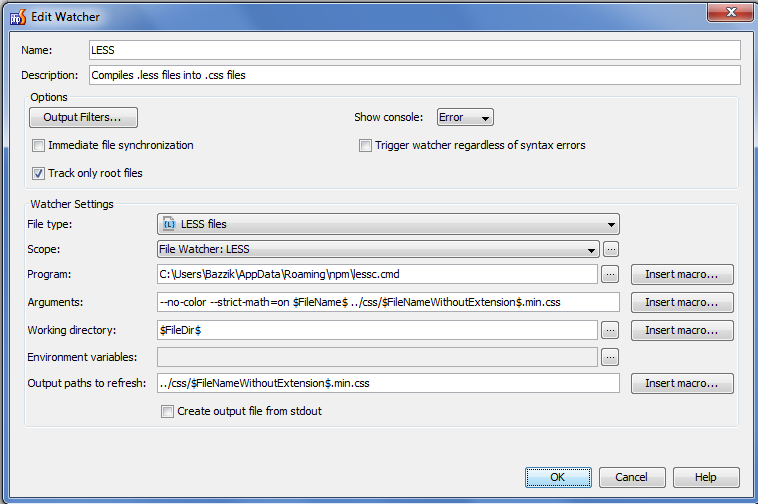 2) is it possible make filewather not produce empty files? 1) I'm on Windows and that option does not work for me for quote some time now. It used to work like that before.